The very first book I reviewed for this blog was Francis Hardinge’s book Fly-by-Night, which was a revelation of language, story and idea; it was everything a new and original fantasy should be. I never hoped for a sequel, but almost four years later, we have one. In Fly Trap, Mosca Mye, Saracen (her lethal pet goose) and Eponymous Clent (her erstwhile employer) have escaped from Mandelion and, after a stint in debtor’s prison and a hair-raising encounter with a pawnbrokers’ auction, they find themselves in the town of Toll. In Toll, all citizens (and visitors) are separated into either Day or Night dwellers, based merely on their names. Eponymous is judged a day-dweller, by Mosca is banished to the Night side–how will they be able to protect the mayor’s daughter, victim of a kidnapping plot? How will they be able to protect themselves when the kidnappers realize they know all about them? And are the terrifying Locksmiths still pursuing them from Mandelion? As usual, Hardinge’s plot is twisty and labyrinthine–in the most wonderful possible way. I only figured out one plot twist ahead of time, but Hardinge twisted that twist three more times after it had been revealed, and I was left breathless and exhilarated. Her indelible characters–each with a perfectly chosen name–are always enthralling, and her word choice and writing style are intelligent and erudite without being impenetrable to the average reader. The book is long, but not as long as many other doorstop fantasies that have been published in the last few years, and the book is so engrossing that the length won’t be noticed. The story is technically a fantasy, in that it doesn’t take place in any real place on earth, but it isn’t a witches-and-wizards-and-magic fantasy–Mosca and her compatriots are more real than many recent characters in realistic fiction books. I highly recommend this book to anyone–child or adult–who likes unique, rousing–even epic–adventures. This is a review for a book I haven’t read. Don’t get me wrong, only a national emergency could keep me from finishing but, I wanted to get this review out ASAP. That being said, for more than a couple of reasons, I feel quite positive that I can give Unsinkable a glowing report. First, I’ve read almost half and the setting and characters have me hooked. Second, it’s by Gordon Korman, one of my personal favorite authors for a good, “ripping yarn.” Third, it’s about the TITANIC. Everything about the Titanic evokes an almost ghoulish fascination. Before a page is turned the outcome is known. But it was such a magnificent ship, with an amazing “cast of characters” that any Titanic story practically writes itself. I can’t get enough, so thank you, Mr. Korman, for feeding my addiction. Talk about “ripping yarns,” this one’s got it all. I wonder how it will end? As any good mother knows, it’s true, children do make terrible pets – they do ruin furniture, they are impossible to potty train, and they have even been known to throw food from time to time. This story is about a bear named Lucy who finds the cutest little critter in the whole forest, a boy, who Lucy promptly names “Squeaker” because that is all he says. Of course Lucy wants to keep him for a pet, and she takes him home to ask her mom. Although her mom has some reservations, knowing how hard it is to care for a pet, she reluctantly says okay. Well, it all starts out just fine – but then Squeaker becomes unruly and makes messes everywhere and things just keep getting WORSE! One day Squeaker disappears, and Lucy follows his scent all the way back to his home, where she realizes he really belongs. This juxtaposition of owner and pet is quite clever, and the illustrations make the story even more enjoyable and funny. This would be great for a read-aloud for kids ages 4 and up, and grown-ups would like the humor too! This attractive picture book shows the life cycle of a monarch butterfly through simple text and colorful illustrations. It begins with a stripy caterpillar and takes us through the various stages as it transforms into a monarch butterfly. Then after flittering and fluttering, the monarch carefully leaves her pearly eggs on leaves and the cycle begins again! Summer is a wonderful butterfly time of the year and sharing this book with your little ones will be a delight for all. This month, Eileen shares How to Catapult a Castle by James De Winter. This engaging easy reader for the most beginning-est of beginning readers will delight parents and children alike. Cat the Cat travels from scene-to-scene encountering many animals and answering the question “Cat the Cat, who is that?” and the animals answer with names like “Duck the Duck” and “Mouse the Mouse” and “Rhino the Rhino”. Until Cat the Cat comes to a creature with large eyes, a blue tongue, four arms and three legs. When Cat the Cat is asked “Cat the Cat, who is that?” the answer from the creature is “Blargie!” Cat takes this answer in stride and goes off to play with her new friend, “Blargie.” The illustrations are adorable in this book and are so cartoon-like you can almost see the characters moving through the page. The text is presented in large white word bubbles and is large and clear for early readers. The repetition of words and sounds allows beginning readers a chance to build some reading confidence with engaging characters and a sweet story. For more beginning readers by Mo Willems, look for Time to Sleep, Sheep the Sheep, Let’s Say Hi to Friends who Fly, and the Elephant and Piggie books. 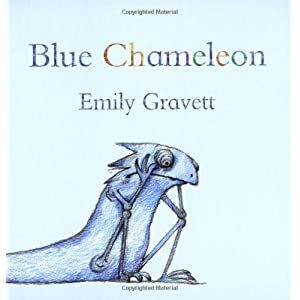 The latest title from Emily Gravett will not disappoint. Chameleon is feeling lonely and blue and is desperate to find some company. He turns yellow like a banana and pink like a cockatoo. He even goes so far as to hop after a grasshopper. Just when he loses hope and gives up, a surprise is in store for him. This is a fun and clever concept book that introduces colors and patterns.